If you’re a fan of sun, beach and good times, Wewaii will put you in the right mood; this is a browser-based simulation game where you have to manage a hotel set in a tropical paradise and turn it into a place every tourist wants to be. However, things aren’t easy and at the beginning we’re left not with a hotel, but more with debris. It’s up to you to use your management skills and create a great vacation resort. First, you have to clean things up and make it more presentable. Choose your hotel name while you’re at it. You’re already spending money getting rid of the rubble, but you also can begin organizing things by moving or duplicating items. Soon you’re buying essential material such as residences, attractions and more. According to our staff and our skill level, building may take a few minutes or some hours. 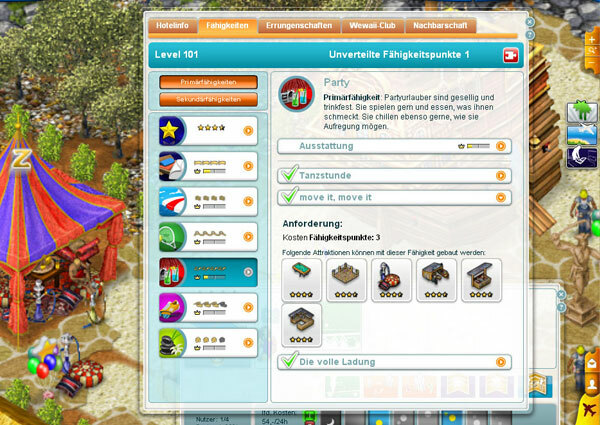 A skill bar on top of the screen is growing as we work on our resort. Each time we climb a skill level, new objects and buildings are unlocked, drastically improving the possibilities. The most advanced players are responsible for some impressive hotels, all with their tourists animated in detail and exploring the different attractions, or just relaxing on the beach. Wewaii is a fun game and features a very original, very soothing setting. It’s a perfect change from most free MMORTS games which are focused on warfare, such as War of Legends, Warflow or Caesary.